Boreal Math: Final Thoughts – CONNECT! Building on the ideas of Dan Meyer, the problem was introduced to the students will less formal structure than the teachers normally would have planned. This allowed the students to be more involved in the “formulation” of the problem than just the “computation” of the numbers. (Great video by Dan Meyer on the topic) The openness of the problem allowed multiple entry points into the problem – since the math was only introduced after some brainstorming and problem solving by the students. Due to this change in structure, far more students found a place to start with the problem. According to Erin Couillard, this is the first time she has presented a math problem to her students where all students knew how to get started on some piece of the problem. While normally there are a few students who approach the teacher for help, not knowing where or how to start, this was not the case with this problem. Erin has also commented that she witnessed more sustained engagement with the problem – longer than she had seen before. Students spent over a week on the problem – and often self-organized into small working groups, depending on the specific part of the problem they were wrestling with. • Are we talking about deciduous or coniferous trees? • What about the difference in oxygen production between small trees and large trees? • Don’t different sized people use different amounts of oxygen? • Isn’t the population constantly changing? • Isn’t the size of the Boreal Forest changing? 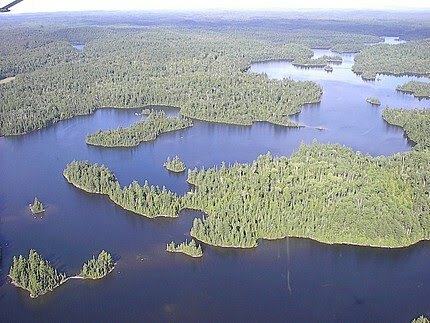 • What about areas of the Boreal forest with lakes or rivers? Erin has commented that these questions made the math more realistic and authentic. The students quickly realized that they were carrying out calculations on moving targets – and understood why estimations and a critical understanding of information sources was important. During the ‘classroom discussions’ video – you can see how Erin embeds the importance of website credibility into the mathematical discussions. This approach allowed students to generate the necessary assumptions, which they were asked to comment on when creating their final podcast explanations. For Erin, this experience can reconfirmed how important the context for a math problem can be, as opposed to what often happens in a math classroom – the parachuting in of a disconnected word problem. The students were fluent with the language, units and ‘topography’ of the problem – giving them a connectedness to the problem that helped with their engagement. 2. The opening up of the problem allowed the students to focus on the problem solving first,and the calculations second. When the problem was presented to the students, there was some superfluous background knowledge, and some information missing. This meant that all students were able to get started somewhere – even if it was just trying to find the current human population. This opening up of the problem also meant that some students quickly bumped up against their own gaps in understanding or misconceptions of mathematics. Erin feels that a more structured problem, similar to what she has given in the past, does not allow students the opportunity to determine which calculation is necessary – it’s often laid out in the problem. The multiple ways to solve this problem meant that student understanding of mathematic concepts became easily visible. Erin was able to easily see which students were struggling – and spend her time intervening with those students. 3. This problem covered the right outcomes and was appropriate in challenge for this age group. One of the difficulties in structuring open-ended math questions like this is finding a problem that allows multiple entry and exit points and multiple solutions, but is also constricted enough to fit a particular grade. This problem worked very well for grade 6 – and the outcomes the teachers wanted to cover (place value, number sense, converting units) were all embedded and then discovered by the students. In the teacher interview Erin comments that this experience has changed everything for her as a math teacher. She no longer wants to teach skills in isolation – but will continue to look for rich problems that will allow her to embed skill development in authentic and engaging contexts. This video captures some of the classroom discussions that occurred during the problem. In it you’ll can see students starting with brainstorming necessary questions – and then working through the various sub-questions that were needed to solve the question. This second video is an interview conducted with Erin Couillard after the students had completed the problem. Emily Brown and Darrell Lonsberry (CSS Principal) are also present during the interview. Watching this gives you a sense of the Erin’s thoughts about the problem – and where she wants to go next with her students.